What Christmas represent for you? Do you feel that instead of thinking of each other, we are expected to shop till we drop? What if you make this Christmas different? Your kind donation will be redistributed to following local charities: L’association des Familles du Quart Monde, l’Assocation Arc-en-Ciel, La Ludothèque, Le Potiron, and Globlivres. So please come and join us! You get an opportunity to taste delicious meals and your children can enjoy workshops. I will be there from 11:30-12:30 and can’t wait to meet you in person. Let’s make this Christmas special together! Je suis heureuse de m’associer avec DeliKits pour soutenir des associations charitatives pour que tous les enfants puissent profiter de Noël: L’association des Familles du Quart Monde, l’Assocation Arc-en-Ciel, La Ludothèque, Le Potiron, et Globlivres. Quand & Où: le 9 décembre 2017 de 11h00 à 16h00 Takinoa Nyon (Place Bel-Air 5). Je serai là de 11:30 à 12:30. Quoi apporter: Jouets, Livres, DVDs pour enfants et adolescents (en bon état). Egayons ensemble cette fin d’année pour tous! What a beautiful and heartfelt post. It is so important to give and give back at anytime but especially during the holidays. There are so many unfortunate families and children out there. This coming Saturday I am taking my daughter to a similar event where we will give some of her toys. 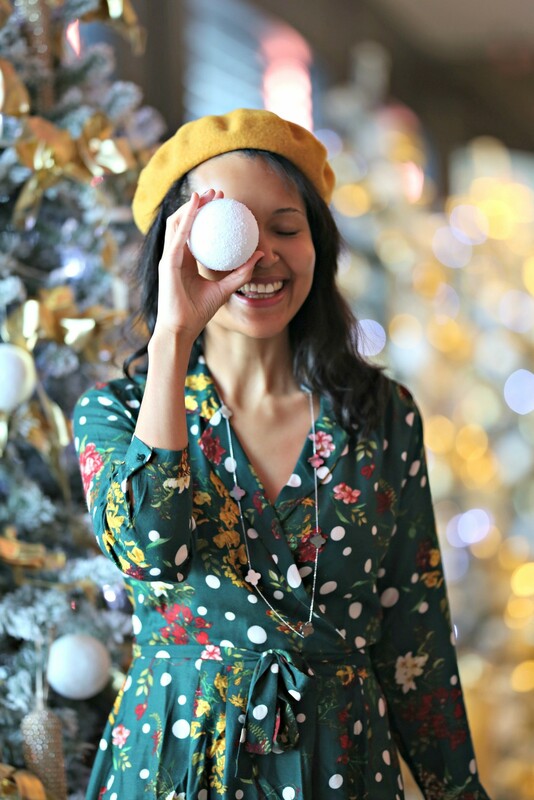 Plus what a pretty dress – perfect for the Holidays and the Christmas tree is stunning! Giving back is SO important and I wish we lived closer so I could’ve stopped by! Such a great post and what kindness you are sharing! And that dress you have on is amazing! This is so nice– you have such a big heart! Also love this dress on you! I think that is such a wonderful idea! We sometimes forget that Christmas isn’t solely about getting presents but also about spreading holiday cheer, especially to people who are less fortunate than we are! Thank you for sharing!